Debbie was gently taken on angel wings to her heavenly home on Thursday, March 21, 2019 where she was reunited with her loving parents, John and Eva; brother, Stephen; brother in law, Tony Bennett; niece in law, Kathleen Grams; and numerous other loving family members who predeceased her. Debbie was born in Vancouver on April 28, 1965. 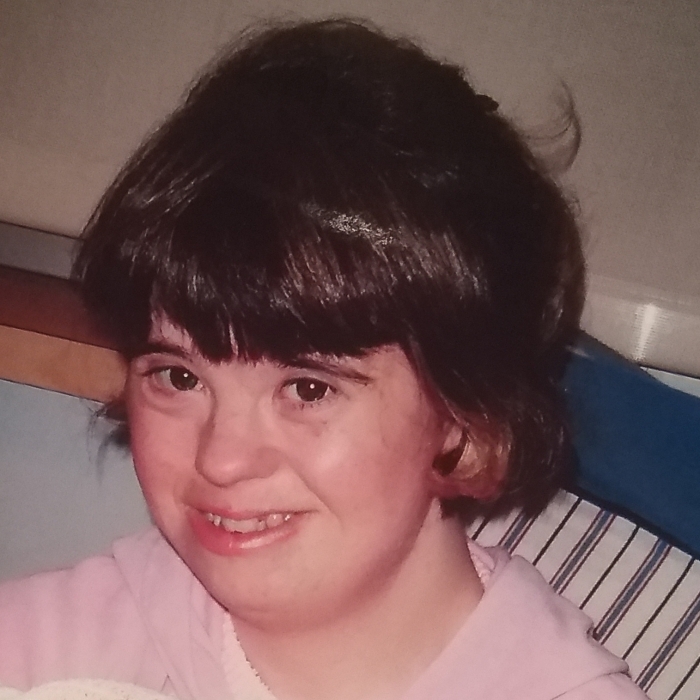 When mom heard that her newborn baby had Downs Syndrome she said that Debbie was “a special gift from God”. She attended Oakridge School, graduating when she was 20. Debbie and Mom were very involved with every activity in the Richmond Special Olympics and made lifelong friends there. She worked at Hero’s restaurant and enjoyed the catering jobs they did. Debbie lived with brother Greg and his family after mom passed away moving to Parksville to live with her sister, Marilyn in 2007. She loved Island life! She became a valued athlete with Oceanside Special Olympics and made many wonderful friends. She also went to Day Programs 5 days a week at Choices and Focus. Debbie was a dedicated employee at Starbucks where she took her job very seriously. The manager said that her beautiful smile made the customers feel welcome. She also loved being a volunteer in the SOS thrift shop. Debbie retired from her jobs when she turned 50 and had been diagnosed with Alzheimer’s. Her last years were spent relaxing at her Island home that she loved. In October 2018, Debbie was admitted to NRGH, transferring to Stanford Place in January 2019. Debbie received loving and compassionate care, both at the hospital and Stanford. Truly living up to mom’s first comment, Debbie was a blessing - a very special girl and our lives were enriched having her in our family. Thanks, Dobs! Her sisters, Marilyn Bennett, Sharon (Gordon) Grams, Joanne (Dieter) Christmann; brothers, John, Greg (Lois) and their families invite those who knew Debbie to join them in celebrating her life at 1:30 pm on her birthday, Sunday, April 28 at her church, Parksville Fellowship Baptist Church, 550 North Pym Street in Parksville. In lieu of flowers, those wishing to honour Debbie's memory may do so by making a donation in her name to World Vision as she cared so deeply for those children. There's still time to send flowers to the Celebration of Life at the Parksville Fellowship Baptist Church at 1:30 PM on April 28, 2019.